He was born in Cremona in 1958 and studied at the International School of Violin-Making in Cremona. He was a student of Maestra Wanna Zambelli and Maestro Francesco Bissolotti. He graduated in 1977 with the judgment of Maestro Pietro Sgarabotto. From 1976 to 1978 he attended a bow making course under the guidance of Maestro Lucchi and graduated, specializing in repair and restoration. He went through a brief period of internship in the workshops of Maestro Luciano Bini and Maestro Claudio Amighetti. 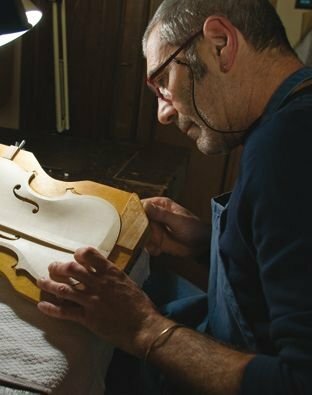 Since 1979 he has been a teacher of practical workshop and later also a teacher of varnishing and restoration at the violin-making school. From 1980 to 1982 he attended Maestro Bruce Carlson's course concerning restoration techniques, which also helped him perfect his skills in violin setup. In 2003 he attended a radiography course in collaboration with Maestro Massimo Negroni and since then he has been responsible for the School Scientific Laboratory. As a personal choice he has never participate in any competition. His production of instruments is principally inspired by the great violin-makers of the classical Cremonese school, such as Amati, Stradivarius and Guarneri. In the framework of the School he took part in the “S.comp.a.r.s.o.” project (Complementary Study of an Antique Original Stradivarius Exhibit) and the “Tancredi" project (reconstruction of instruments from the baroque era).